To find the highest waterfall in Minnesota, you must travel all the way up to Grand Portage State Park, which sits on the Minnesota/Ontario border. Torrents of water fall 120 feet to the Pigeon River below, making for a dramatic scene. Getting all the way up to Grand Portage from Minneapolis can be a good five hour drive, however. For an easy day trip, we went in search of some of the best waterfalls in the region that are a mere two-hour drive or less from Minneapolis. Some of these are right in the city, while others are hidden away in state parks and other wilderness areas. If you’re in search of a daylong adventure, these destination waterfalls are hard to beat. 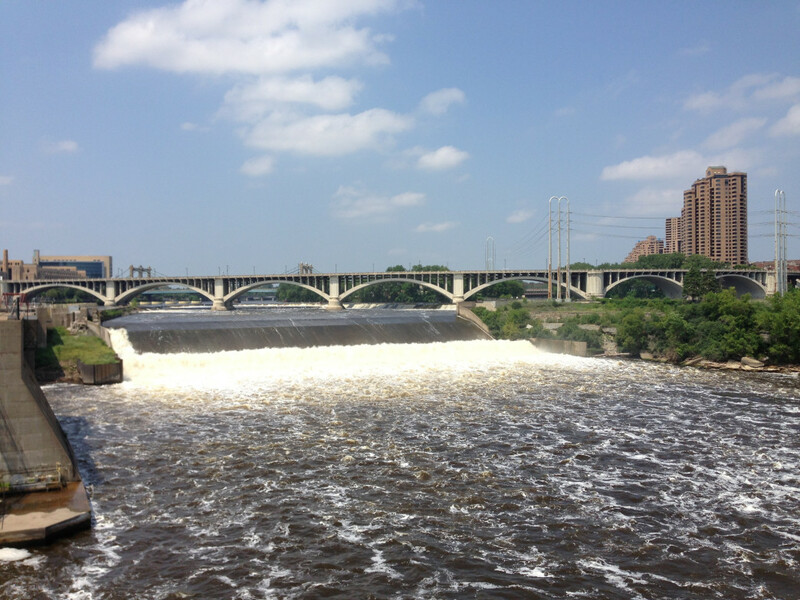 An important part of the downtown landscape, Saint Anthony Falls was once the only natural major waterfall along the Upper Mississippi River. An industry-related collapse of the falls occurred in the 1869, requiring repair which restored it to its current state. It is said to no longer be as dramatic as it once was, but it continues to attract visitors from near and far season after season. 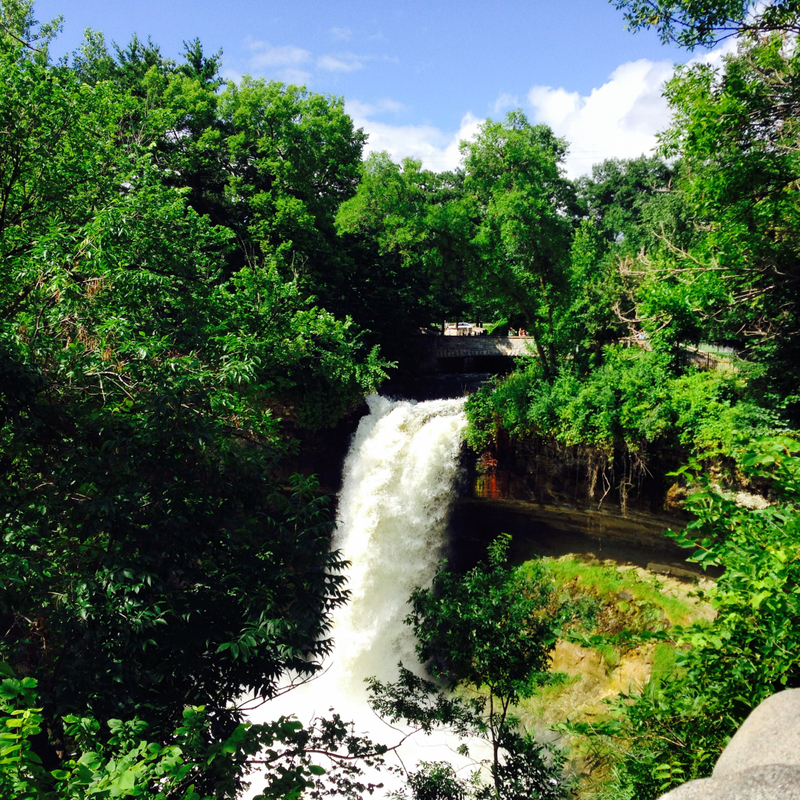 Located in downtown Hastings, this 35-foot waterfall is easy to visit. Bring along your bike or running shoes and you can follow the trail that travels in both directions along the Vermillion River. Vermillion Falls Park is also a great spot for a picnic along the river bank in the summer months. 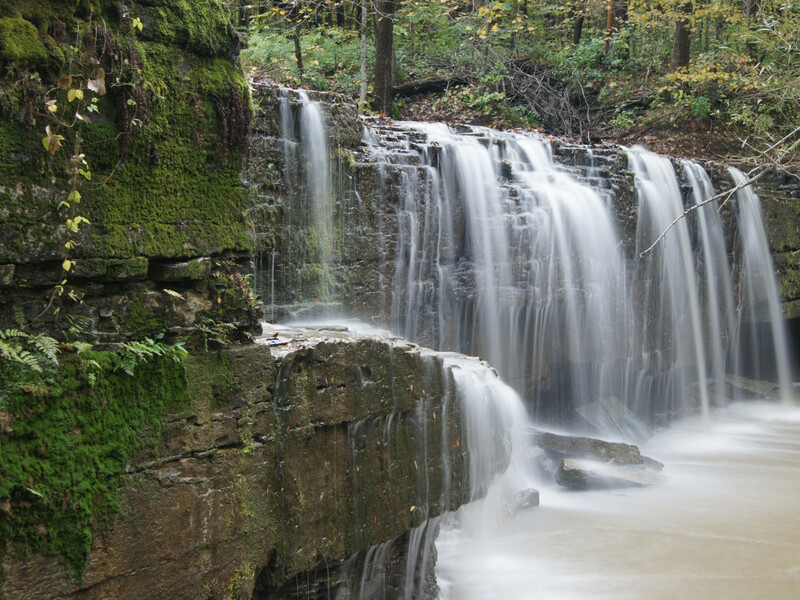 The scenic Ramsey Falls is situated in Alexander Ramsey Park, which at 219-acres, is the largest municipal park in the state. Dubbed the “Little Yellowstone of Minnesota,” a great hiking trail, stunning vistas, and trout streams are at your fingertips. 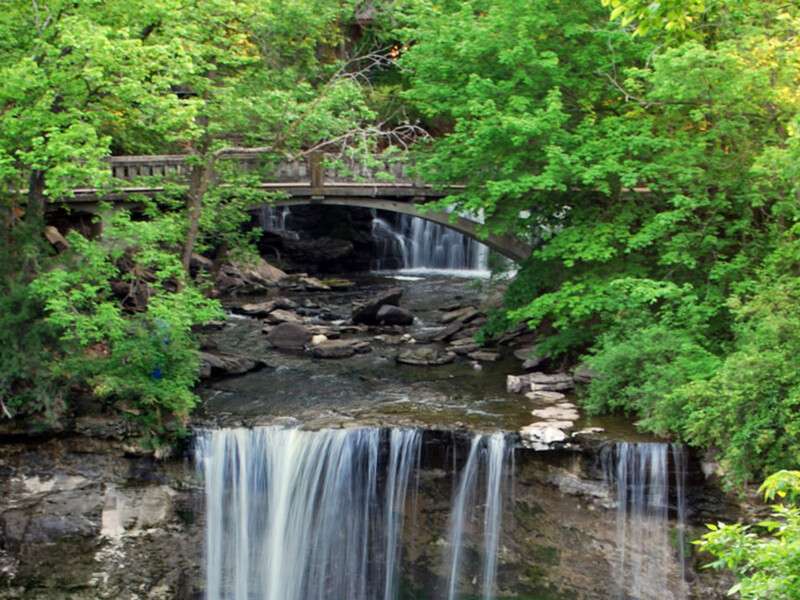 “Minneopa” is derived from the Dakota language and means “water falling twice.” The gorgeous waterfalls of Minneopa Creek located in Minneopa State Park near Mankato are well worth the drive from the Twin Cities. Flowing over an 8-foot cliff and then dropping another 39-feet to the creek below, this is said to be one of the most beautiful waterfalls in southern Minnesota. If you’re interested in making a weekend of it, the park offers camping and hiking along the Minnesota River as well. Situated in Nerstrand Big Woods State Park, an hour south of the Twin Cities, Hidden Falls is a smaller waterfall, but still quite scenic. Amidst prairies and woods, you can unexpectedly stumble upon these "hidden" falls when you're hiking in the park. If you’re looking to simply get a quick glimpse as you’re driving through the area, the falls are an easy half-mile walk from the parking lot. 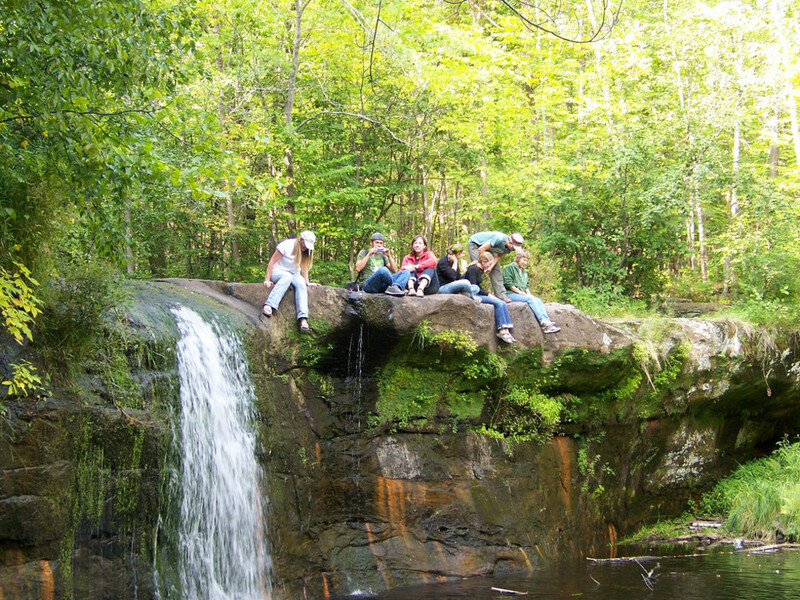 Minnemishinona Falls was an unknown gem located on private property until less than a decade ago when the county bought the land. 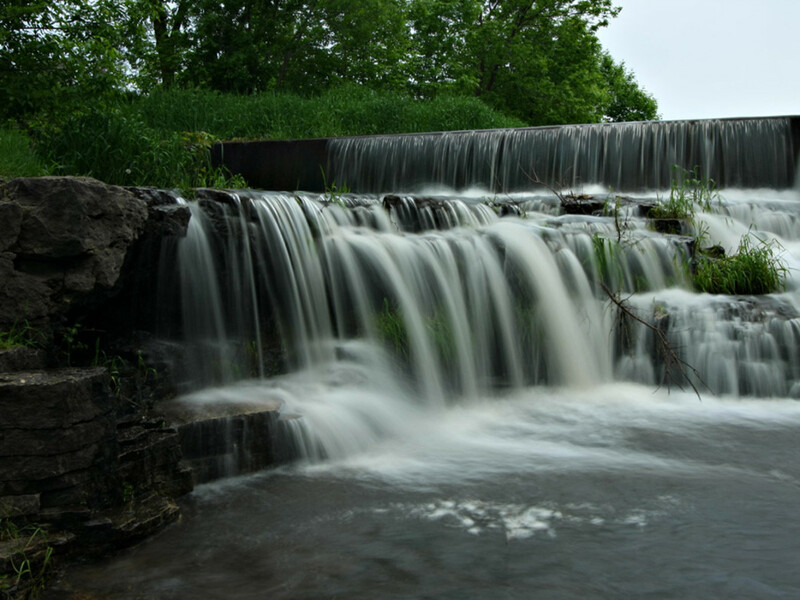 Three miles west of North Mankato, these falls plummet 42-feet into a small pool, which streams through a deep gorge and eventually reaches the Minnesota River. Just a short drive from US Highway 169, you can check out the scenic overlook of the falls on Judson Bottom Road. This is the best known waterfall within city limits. 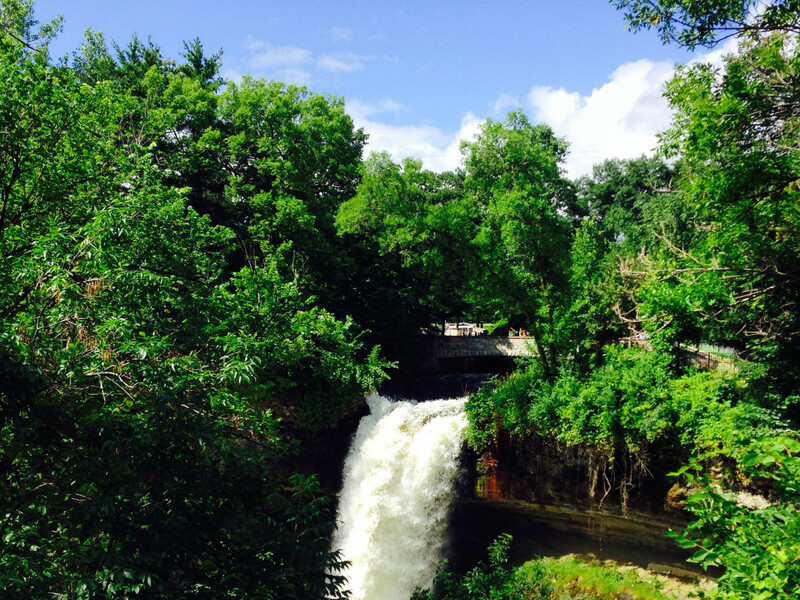 The Minnehaha Falls drop 53-feet to the Minnehaha Creek, which serves as a tributary for the nearby Mississippi River. The surrounding Minnehaha Park has great running and walking trails, a dog park, bike rentals, and a restaurant on site. The focal point of Willow River State Park just north of Hudson, Wisconsin is Willow Falls. An impressive cascade, this waterfall drops over several ledges before flowing over into a 200-foot deep gorge and eventually reaching the St. Croix River. Less than a half-mile walk from the trailhead, this is an easy one to check out. Of course your best option is to stay for the weekend so you can fully explore the countless trails the 2,891-acre state park has to offer. Situated in Banning State Park near Sandstone, this is a great place to both see and experience some whitewater. The impressive Wolf Creek Falls make for a great photo opp and the Kettle River offers some of the best whitewater kayaking in the Midwest. With rapids that tout names like "Blueberry Slide," "Dragon's tooth," and "Hell's Gate," how could you resist?